1100+ Positive Feedback, 20000+ orders, No Negative Feedback, 100% genuine improvement, Best investment, Scale-up Your Business Today! 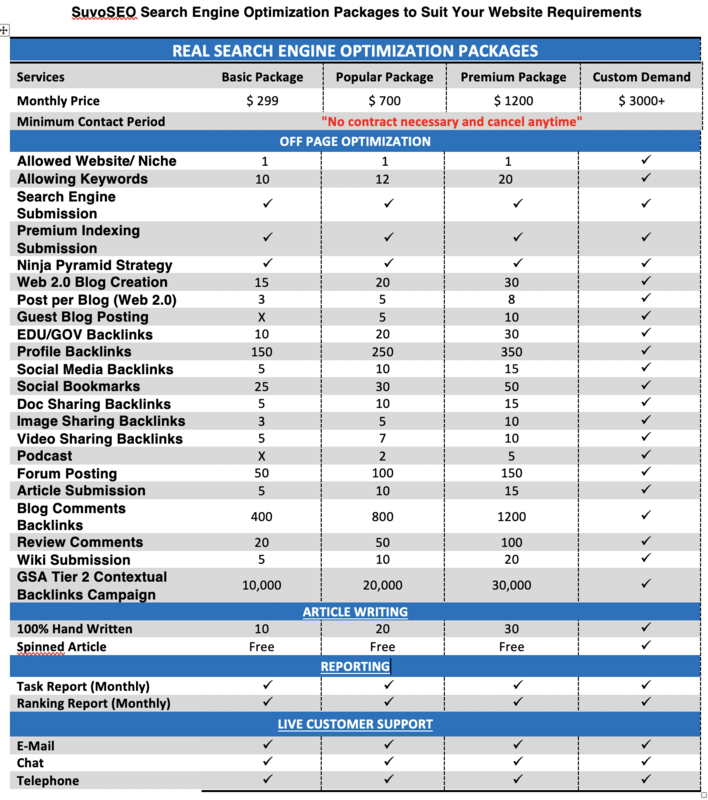 I am sure every one of your dreams about a position in Google’s Top 3 but are struggling with a poor ranking, limited traffic and because of that no leads or sales. This can be improved tremendously though by ordering our latest flag-ship THE NEW CATAPULT SEO MONTHLY PACKAGES by SUVOSEO to Scale-up your business! If you want "Popular Package" Order with "Extra 1"
If you want "Premium Package" order with "Extra 2"
What is the quality of your links? And the DA/PA/DR/PR? ** As you know Google is not updating the PR Since 2013 so we know recognize the quality of links by DDA/PA by Moz or DR/PR by Ahrefs. Our all links will be from minimum DA PA 40+ Domains. We do give importance to High DA/PA because one High DA/PA link means one vote in Google’s way to support your sites. DO YOU ACCEPT ALL NICHE WEBSITES? ** You will get more visitors to your site and visitors mean more leads and more sales. Research proved that a First page Google Ranking can get up to 100% more traffic than the rankings of the 2nd pages. However, I can’t promise visitors or sales. What I can promise though is better visibility of your site and because of this more traffic is likely to visit your site. ** It's easy and simple, scroll down the page and see ORDER NOW button below this text, press it and you will see within a few minutes somebody will say Hello! to you!! 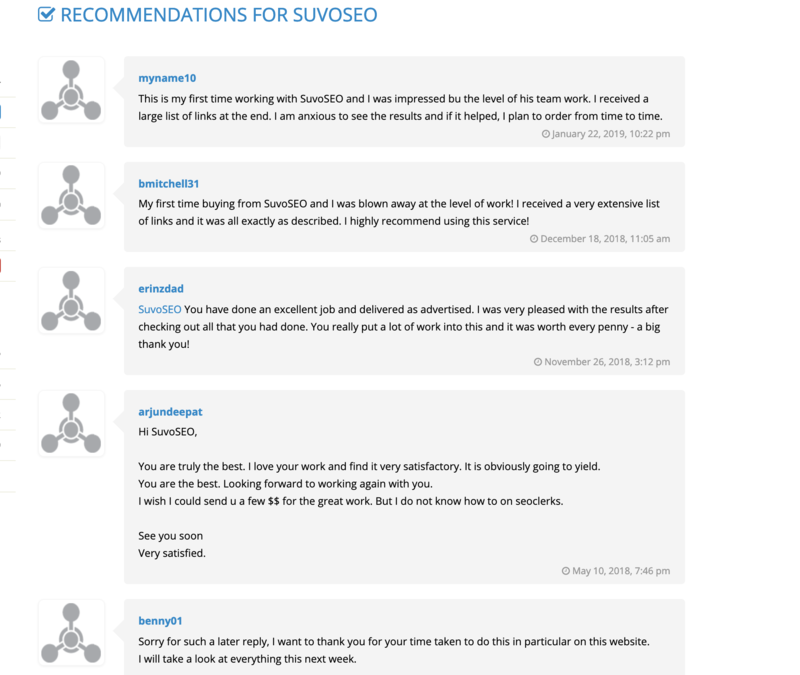 BEST OF CLERKS 2019 - THE NEW CATAPULT SEO MONTHLY PACKAGES by SUVOSEO is ranked 5 out of 5. Based on 17 user reviews.